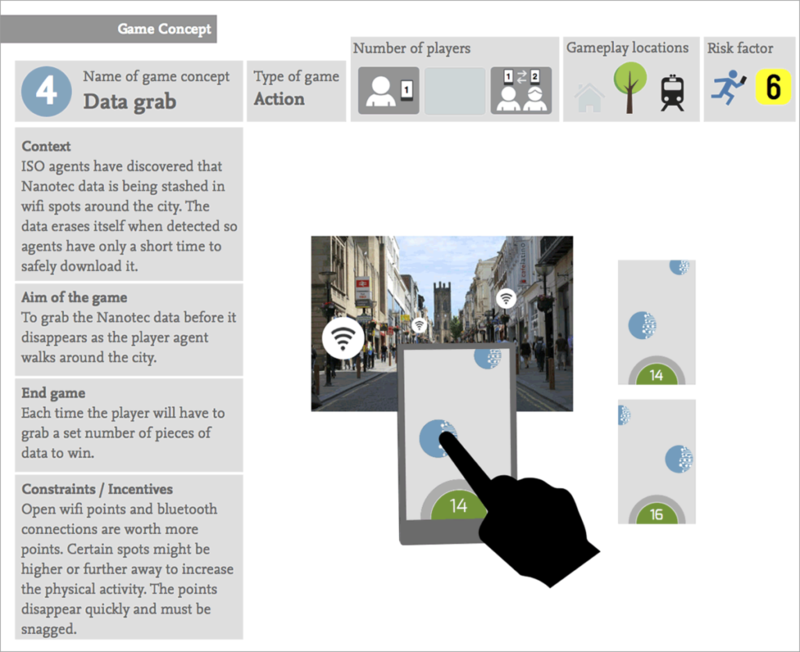 One of the projects I worked on at BERG was a mobile game for a multinational tech company that was intended to showcase the hardware sensors onboard a forthcoming phone. 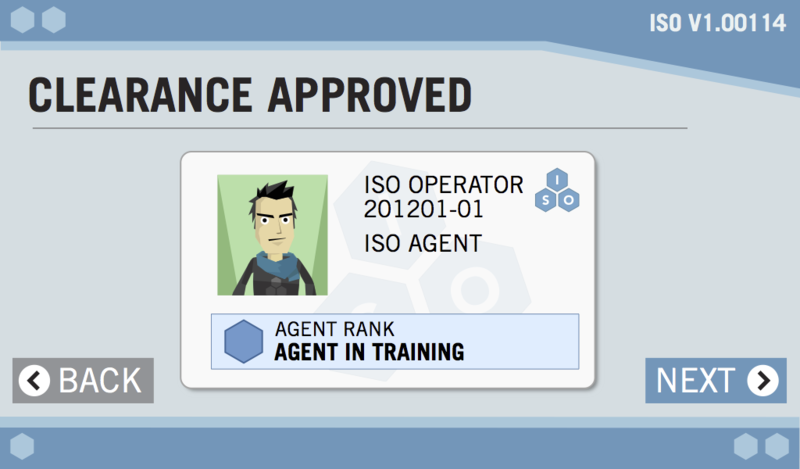 The concept for the game is based around the idea of the player joining the international cyber agency ISO in their fight against the nefarious Nanotec Corp. The game comprises of a series of fun mini-games that all take advantage of the device’s sensors (including accelerometers and gyroscopes) and other hardware features. Each game is meant to be physical and best played on the move. I was involved in the creation of concepts for the games and worked with developers and the excellent illustrator and animator Matt Thomas (AKA OpenByHand) on their implementation. Frustratingly the project stalled because of an internal restructuring inside the client company and the full game was never completed. 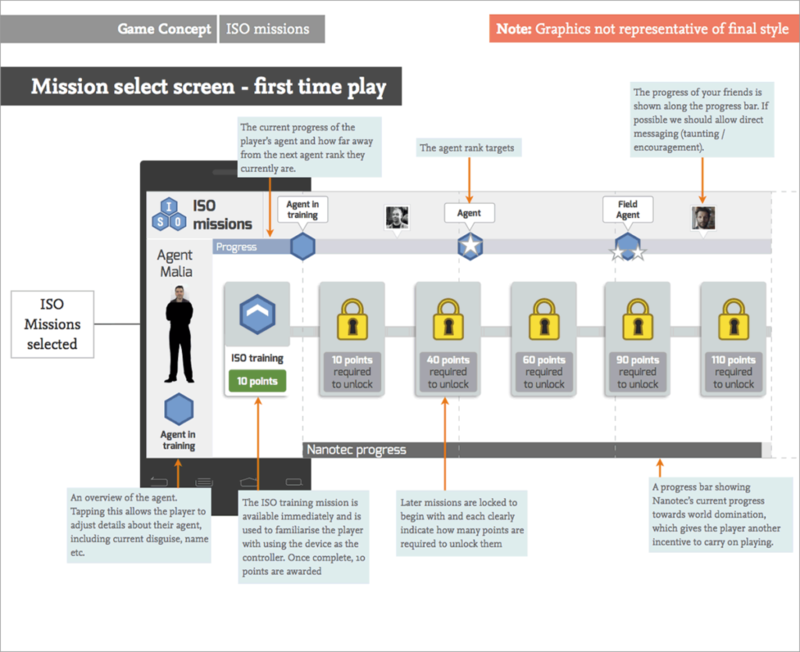 Sketches detailing how the on-screen game introduction could flow. 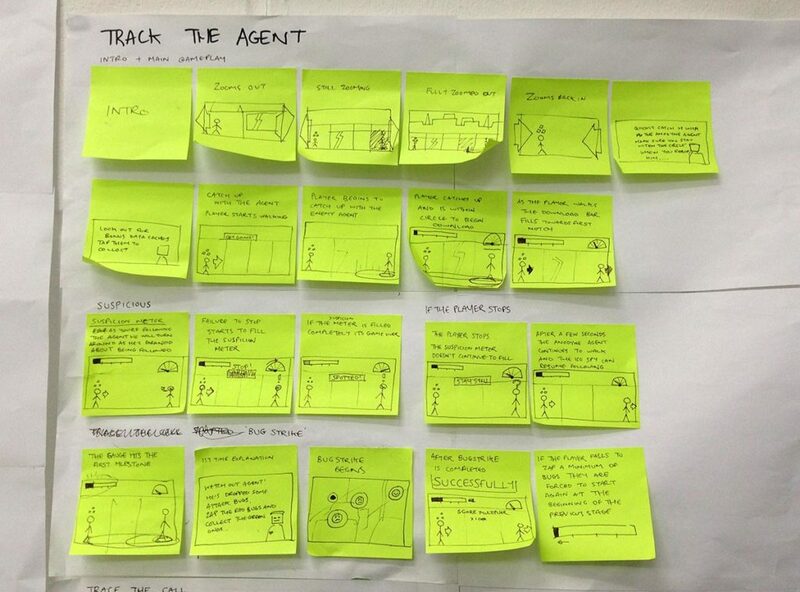 Sketches for one of the games, named Track the Agent, in which the player’s movements control their on-screen avatar (via motion sensors) and try to track an on screen enemy agent without being spotted. 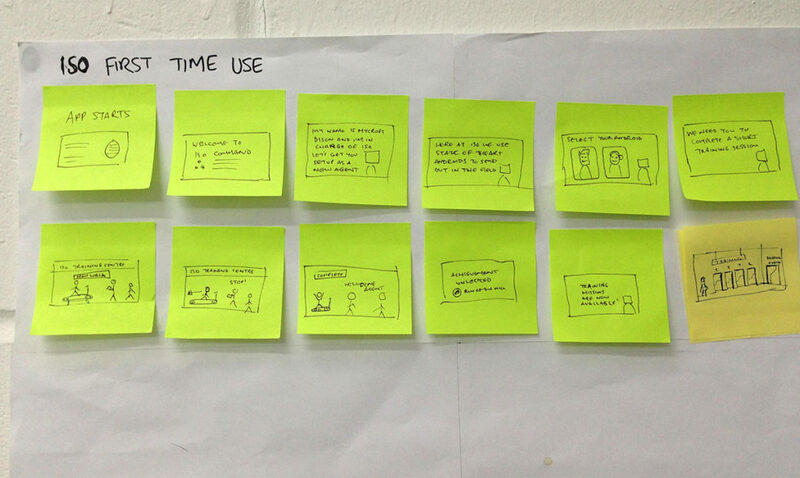 An example of one of several game concepts that I detailed for presentation to the client. This was part of a larger document that detailed a number of possible game concepts from which we selected a handful to work on. As well as game concepts I worked on UI and details around the way the player progresses through the game. This screen, taken from a larger presentation, shows how the player unlocks new stages and games as they progress. 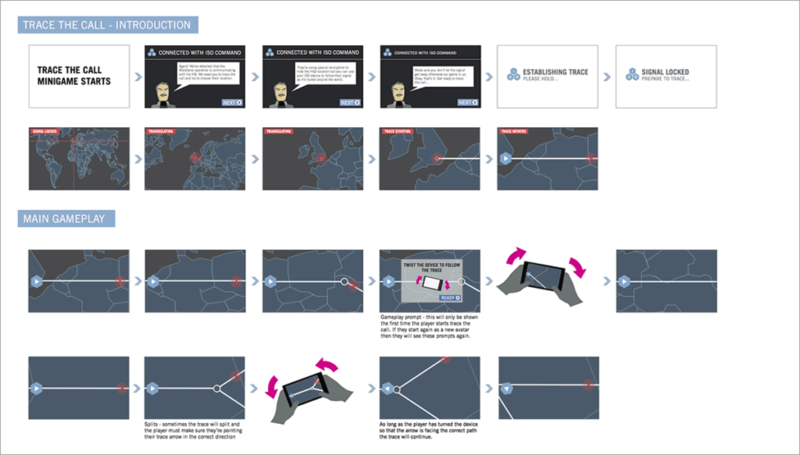 This is a small snapshot of a the flows I created to explain how each game would progress. In this case it’s the introduction to the game that teaches new players how the interactions work. The characters and backgrounds were illustrated by Matt Thomas (OpenbyHand). 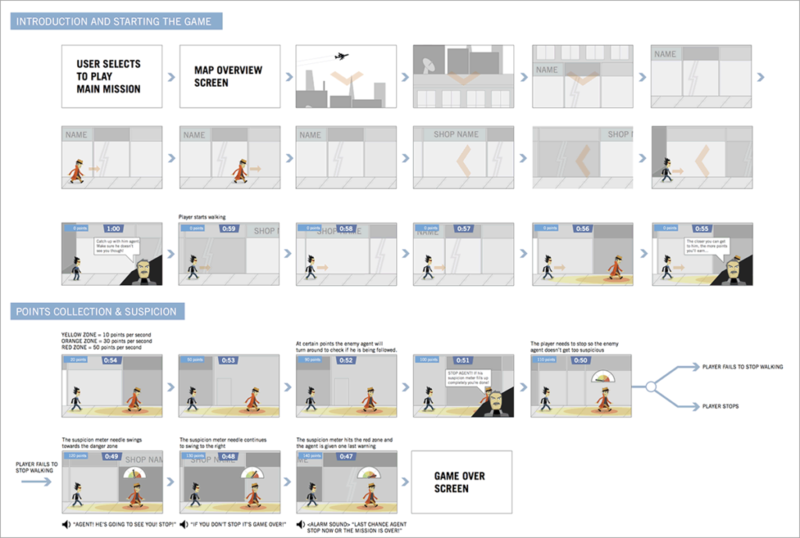 This is another snapshot of a game flow diagram, in this case for the Track Call game, which saw users following a fast-moving call interception by tilting the phone in order to track its movements. 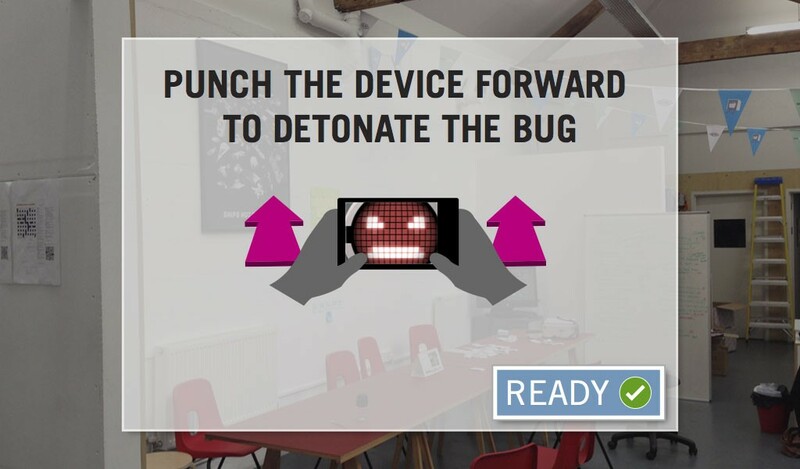 An on-screen prompt for the game Bug Attack that I designed, featuring a character design (of the bug) by Matt Thomas (OpenByHand).